The TPO test measures the thyroid peroxidase antibody blood level to help assess thyroid health. What is a TPO test? The TPO test measures the thyroid peroxidase, or TPO, antibody blood level. Why is a TPO test important? TPO antibodies can cause conditions resulting in an underactive thyroid gland. This TPO Test is a blood test. The TPO test, also known as a TPO blood test, thyroid peroxidase antibody, TPO antibody test, and TPO Ab test, measures the TPO antibody blood level. Thyroid peroxidase, or thyroperoxidase (TPO), is an enzyme that is important in thyroid hormone production. When the immune system is overactive, it can produce special proteins called TPO antibodies which slow or stop TPO's activity. By blocking TPOs activity, TPO antibodies cause the thyroid gland to be underactive - a condition called hypothyroidism. Because they are often present when hypothyroidism is diagnosed, TPO testing is often performed with the TSH test and as part of the hypothyroidism test panel. TPO antibodies are also related to more specific thyroid conditions in which the thyroid gland is underactive. Two of those conditions are Graves' disease and Hashimoto's thyroiditis. As a result, TPO blood testing is also performed as part of the Graves' disease test panel and the Hashimoto's test panel. TPO antibody testing is sometimes performed with the TSI blood test as they are both types of antibodies that interfere with the normal functioning of the thyroid gland. To get a TPO test near you, simply order online and get your blood drawn at the Quest Diagnostics lab. 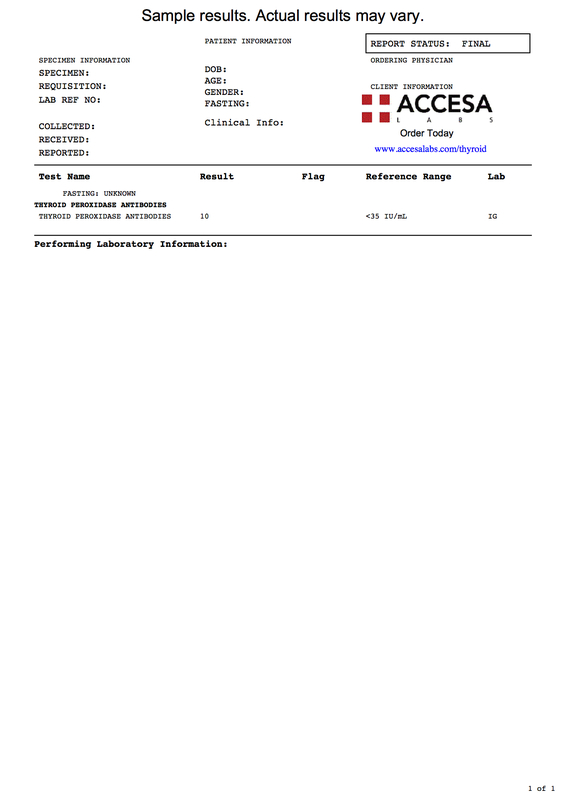 Once your TPO lab results are ready, they will be available for download. As can be seen on the sample TPO lab report, the TPO blood levels are reported as a numerical value and can be compared against the reference range provided by the lab. TPO Test at Guaranteed Prices.